A lucky eagle find for you up in a tree too Rebecca. 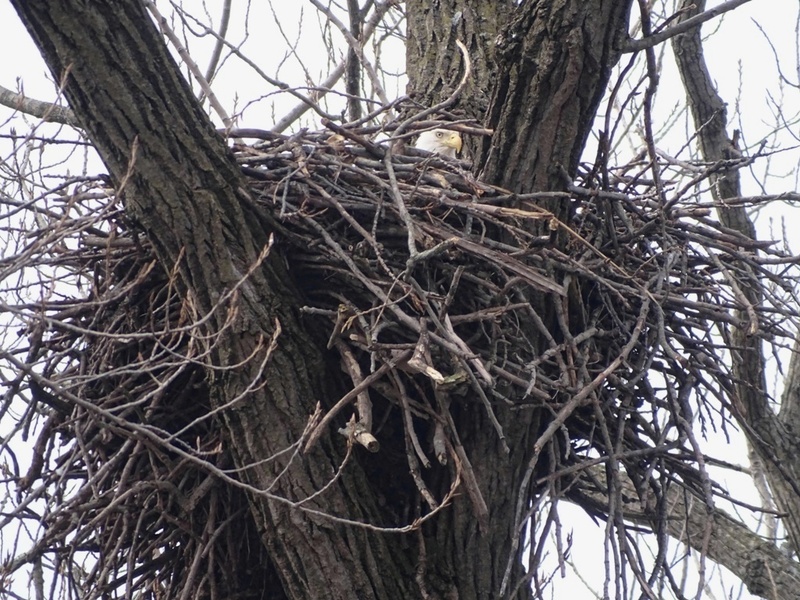 Now I’ve never seen an eagle’s nest … its amazing how big they are. I’d see the eagle’s nests on http://www.explore.org but only inside the nest, not outside. At Lake Erie Metropark an osprey has built its nest, which looks large and twiggy like this one, atop a tall pole where they have the emergency sirens for the fire station. They do test the sirens and the interpretive guide at the Park says the noise does not bother Mama Osprey or her babies in the least – she continues to stay there. I’ll bet you look up every time you drive by – I know I would. I was amazed with this osprey and I had to wonder how that nest stayed up there as the pole was not that wide and it seemed this big twiggy nest balanced on top, stabilized by the big sirens. they’ve started to nest,ours will be nesting in a month or so. Our nesting season peaks in late February. You can tell this nest has been there for a couple of years by its size. They add more material each year.